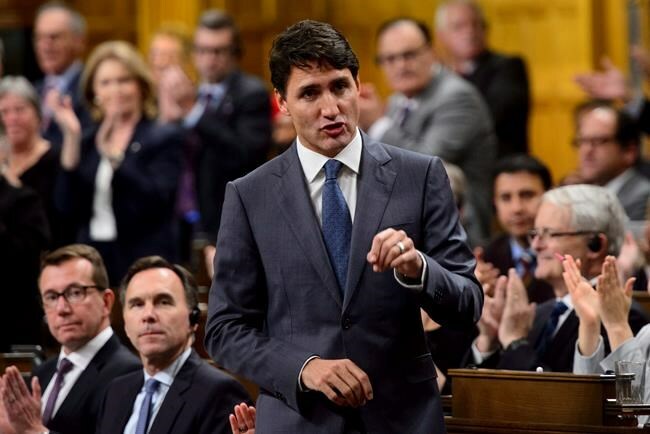 OTTAWA — Canada will pursue deeper trade ties with China, Prime Minister Justin Trudeau said Tuesday as the government rejected accusations its new U.S.-Mexico trade deal ceded sovereignty over that goal to the Trump administration. The government found support from Canada's chief negotiator of the original North American Free Trade Agreement, who said an unusual clause covering future free trade with "non-market" countries did not infringe Canadian sovereignty. The new U.S.-Mexico-Canada Agreement allows any of the countries to withdraw from the deal on six-month's notice if one of the partners enters into a free trade agreement with a non-market economy — language widely seen as referring to China. The USMCA also requires a member country to provide notice and information to the other two partners if it plans free trade talks with a "non-market" economy. The clause in the new agreement — which still needs formal approval in all three countries — gives the other partners a say in the text of such a deal. Conservative MPs repeatedly referred to that clause as a "Trump veto" during question period, while trade experts remained divided on whether that was in fact the case. Trudeau said pursuing deeper trade with China remained a part of the government's economic diversification strategy that has seen it sign a free trade pact with the European Union, move to ratify the rebooted Trans-Pacific Partnership this fall and push for deeper ties with South American countries. "Obviously, China is a significant, growing player on global trade. And we, as always, will look for ways to engage, deepen and improve our trading relationship with them in ways that are beneficial both to Canadians and to everyone," Trudeau said at an event in Vancouver. Canada's efforts to formally start free trade talks with China stalled late last year and there are no plans for formal talks on the horizon. Chinese leaders bristled at the Trudeau government's progressive trade agenda that includes gender, labour and Indigenous rights. John Weekes, Canada's chief NAFTA negotiator in the early 1990s, said the new clause is no different from the pact's original clause that gives any country the right to terminate the agreement on six-month's notice for any reason. "I don't really like it," Weekes said of the new "non-market" clause. "But in terms of rights and obligations, it doesn't impose any obligation on Canada not to negotiate an agreement with anybody. We don't undertake to do that." President Donald Trump is embroiled in a trade dispute with China that has seen the U.S. impose tariffs on hundreds of billions of dollars worth of Chinese goods, prompting Beijing to retaliate. The inclusion of the clause surprised many trade experts, some of whom said it would impede Canada's trade aspirations with China. "The U.S. could conceivably terminate for Canada engaging in a free trade agreement discussion with China," said Cyndee Todgham Cherniak, a Toronto trade lawyer on Canada's roster for settling disputes under NAFTA. "This impinges on Canadian sovereignty — the U.S. gets to tell us who we can enter into a free trade agreement with." Patrick Leblond, a University of Ottawa trade expert, said it doesn't give the U.S. a veto over Canada's trade policy. Besides, he added, "Canada would not negotiate a deal that would threaten its access to the U.S. market. The United States as a market remains much more important than China ever will." A spokesman for Jim Carr, Canada's new minister for international trade diversification, said nothing that Canada agreed to in the USMCA would hamper the ability to pursue trade a trade agreement with China. Joseph Pickerill said Canada is making sure its "interests and values" are protected as it continues exploratory talks with "a complex market" such as China, and while it prepares to send a trade mission there next month. "The rationale agreed to under USMCA aligns with this approach, and in no way infringes on Canada's sovereign right to develop commercial relations with any country of its choosing."